His face has appeared in sandwiches, on tree stumps and even a dog’s ear. 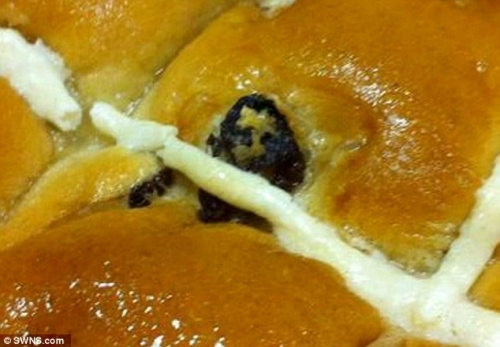 Now, on the eve of Easter, a shop assistant has spotted the image of Jesus Christ in a hot cross bun. Mother-of-two Lindsey Norman noticed the uncanny resemblance in a six pack of £1 buns she had purchased from her local Sainsbury’s in Peterborough, Cambridgeshire. Posted in Where is Jesus? Doesn’t matter what she thinks she saw. If she drops it on the floor, any dog will eat it. Hot CROSS bun… I get it! Thought it looks more like Einstein.